Debunking Christianity: Family Secrets: Is Your Heavenly Father A Psychopath? Family Secrets: Is Your Heavenly Father A Psychopath? The movie serves as a powerful illustration of the mental trauma which Christians face when they are first confronted with rumors of unsavory secrets in their family history. Could the loving Heavenly Father which they have known actually be a brutal and heartless psychopath? Do they dare stir the dust of doubt by digging around in the ancient archives of Yahweh, reading what was written about him in old diaries and tattered documents? What a terrifying precipice to be poised on – the possibility that everything you thought you knew about a most perfect and loving father, could be lies! The stomach-churning vertigo of such a dizzying proposition; that the God of Heaven and Earth could fall from grace in your eyes. Will you dare to gaze into the abyss? Or will you avert your eyes and refuse to pursue truth? Those of us who had been indoctrinated to believe in the God of love and pure perfection - only to discover his true identity, clearly revealed in the ancient stories of the Jewish faith – know the horror and shock of such a discovery. We ask ourselves, how we could have been so blind, when the truth was hiding in plain sight all along. That sinking feeling which comes with realizing that we have been fed carefully-constructed lies all of our lives is devastating. 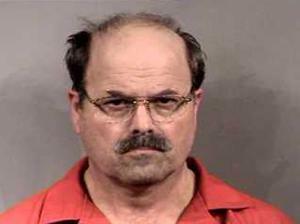 Imagine how the friends and family of Dennis Raider, the BTK (Blind-Torture-Kill) serial murderer felt he was convicted. The man they had known as a husband, father, Scout leader, and devout elder in the Lutheran church was the very same man who had tortured and murdered ten people. Suddenly everything they thought they knew about him was turned upside down. Finding out that your Heavenly Father is a murderous psychopath can be quite traumatic. For some, the knowledge is simply too awful, so they willfully blind themselves to the unpleasant truth, carefully avoiding the incriminating passages scattered throughout the Bible. For them, it is easier to live in denial in order to preserve the falsities they believe in. They prefer a pleasant fiction to a harsh truth. For those of us who have a deeper inner drive to pursue the truth regardless of where it leads, closing our eyes is not an option. We have gazed into the abyss and seen the depraved depths of the Bible’s god of blood and death. We have looked behind the curtain and seen the human hands pulling the levers of religion. We have had the courage to challenge the sanctified lies of Christianity, and to walk away. If you are a Christian and have not looked into the family history of your Heavenly Father, what will you do? Will you pursue truth at all costs, or will you slip on the blindfold of faith and fall into line, keeping rank with the procession of the blind?